Well YESTERDAY was an exciting morning! Sarcasm: check. I struggle to get out of bed. Every. single. morning. It doesn’t matter if it is 4AM or 2PM, when my alarm goes off, the only thing that I want to do it turn it off, not even snooze it, turn it COMPLETELY off, roll over and close my eyes once again. Especially if a dream was interrupted. This whole not-wanting-to-wake-up thing is going to REALLY be a pain after Memorial Day when summer hours start, and I’ll have to be at the office at 7:15… When I struggle to leave my APARTMENT at 7:15. Shoot. Anyways, yesterday morning was like any other morning, including hitting the snooze 3 times and then having a heart attack when I realized that it was 6:30 ALREADY, and SHOOT if I didn’t get in the shower NOW I would look like a wreck at work. So I got up. At 6:50, juuuuuust as I was straightening the last out-of-control piece of hair on my head, the power went out. AWESOME. I stood in my bathroom for about 5 minutes brainstorming. … can’t OPEN MY GARAGE DOOR. Ohhhh mother. At 6:54 I called my boss, who I knew would already be at the office. Boss: G’morning this is Sara’s boss. Sara: Hiiiiiiiii Bossssss, this is Sara Vanderstappen calling. Boss: … Are you ok? Boss: Alright, Sara, that’s just fine. Now, don’t start panicking, you’ll be alright. For the record, I wasn’t panicking at all. But he’s seen me panic before – he knows me so well. So, I continued standing in the middle of my living room. In the dark. Then, I decided that I could brush my teeth. Mid-teeth cleaning, the power went back on!!! Using my brains, I threw my toothbrush in the sink (I turned it off first. It’s electric. And one time – I have no idea how this happened – it fell out of my mouth while it was still on, and I was really proud of myself because I caught it in my hand, but then I was an idiot again, because I was standing in front of the mirror with my electric toothbrush still on, and there was toothpaste EVERYWHERE. Including in my hair and on my face. Not one of my finer moments…) and ran over to my living room where the clicker to my garage door sits on the entertainment center. I opened my garage door, just in case the power decided to go out again. JUST when I was screwing the top of my mascara back into the base, the power went out AGAIN. UGHHHHHHHH so ANNOYINGGGGGG. And apparently no one else in my building has to get to work at an early hour, so no one else cared. I ate a bowl of cereal, packed my lunch (all in the dark), and was on my way. My garage door stayed open for the day, but it’s no big deal because the only thing in my garage is a shovel that cost $3.00. Knock yourself out, thieves. As I was driving, I noticed (kind of hard not to…) that the stoplights were out. Havoc was wreaking among the citizens of Northwest Green Bay! Just kidding, every one was actually really calm, cool, and collected, and took turns and everything so no one got killed. So that was nice. When I got to work, it was pouring rain outside, and so I was “running” from my car to the building, because since it was dark in my apartment when I left, I couldn’t find my umbrella. As I was “running” in the pouring rain, I hear something clatter to the ground and fall face-down into a puddle. I picked it up and continued to the building. Upon arrival at my desk, I mopped up my phone and took out the battery. That would have to sit for a little bit. Do you see the red? 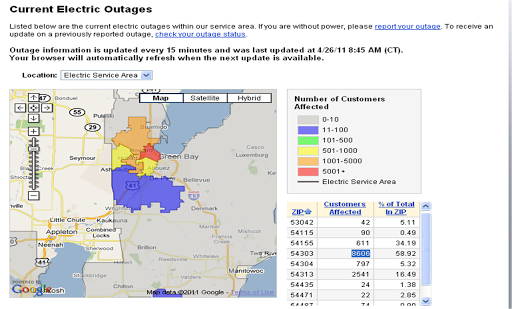 Where “5001+” customers are affected? That’s where I live. My phone was doing some crazy stuff all day yesterday, but finally started working normally, and when I got home from work last night after a stop at the mall to return some shoes, a stop at Orange Julius to pick up a little treat for Peter, and a stop at Peter’s office where everyone was working WAY late, all of my lights were on. I guess the power went back on around 1. WHEW good thing I thought fast and opened my garage door when the power was on for that little bit of time!! And it’s a good thing I had the sense to turn off my straightener so that the building didn’t burn down. Because that would have REALLY sucked.